My Life. My Adventure. My Discovery. I forgot all about blogger application! So here I am blogging when little boy is fast asleep. So I have officially become a full fledged preschool teacher. I am definitely passionate about it and know that I have much to learn. In whatever I do in this ministry, I want to make sure I glorify God. I am praying for His wisdom and guidance. Next, I am having a little life in me! It's a princess this time. This pregnancy hasn't been smooth sailing. All I can say is, God has really been my strength and strong tower. I am glad the little girl is growing. And praise be to God that Isaac is very accepting of his soon-to-be status of being a big brother. He often speaks of this sister and even tries to think of a name together with me. And here is a really cute conversation to share. While watching Sofia the first, I asked him if the name would be nice for his sister. He said,"no... It's not a nice name for Mei Mei." Then he continued,"Let It Go is a nicer name for Mei Mei.". I had such a good laugh. 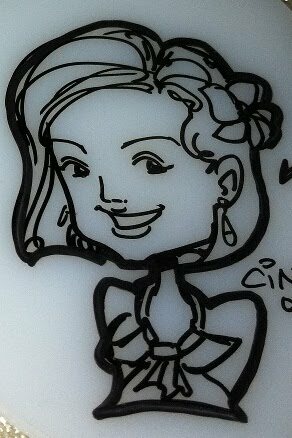 Can u imagine "Let it go Teng"? I think our little girl will query our wisdom in the name selection. We will happily credit it to her brother. Isaac is growing to be such an adorable and cooperative boy. I really thank God for blessing us with him and for giving us parenting wisdom. All we do is cast our eyes on Him. Naturally, I do have my challenges at work too. I really pray for his grace and wisdoms. All right! Till next time. P.s. It's another milestone today for us. 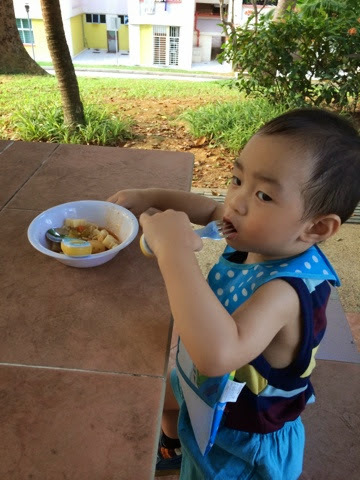 Isaac wore underwear only the whole afternoon and was able to pass urine in the toilet when needed. Time to stock up on underwear for him!!! My boy is growing really fast. 3am and I am supposed to be up to read some notes and prepare materials for Monday's lesson. Call it procrastination, I am here, laying wide eyed surfing Facebook and going through photos. And then I found these photos taken recently with Isaac. 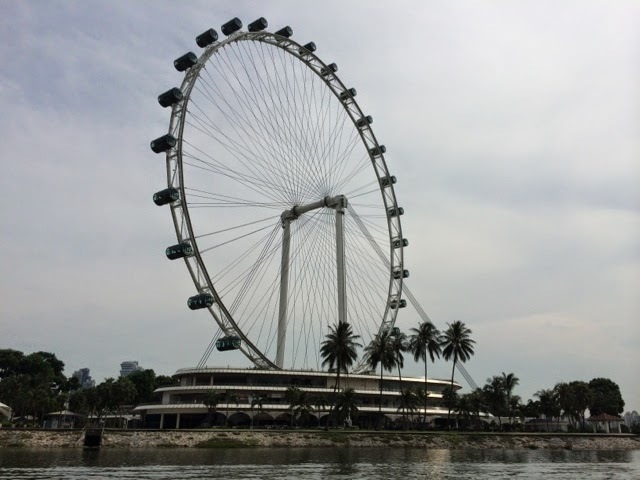 When Derrick was busy at work, we enjoyed ourselves being tourists on a Duck Tour and had dinner at the park near our home. 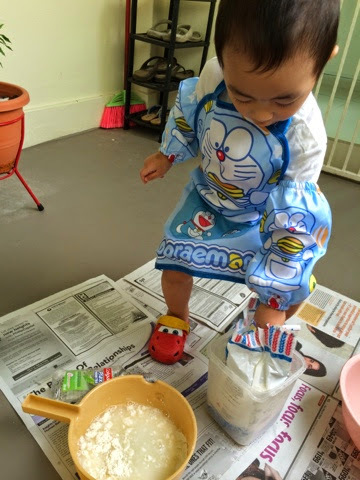 We also played with flour outside the house. 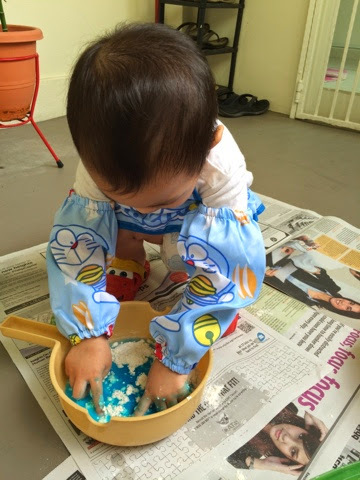 It was supposed to be play dough making session. But a child his age will only explore. So, it became a messy session. I love moments like these with him. Just getting connected and spending time building experiences and memories for his childhood. 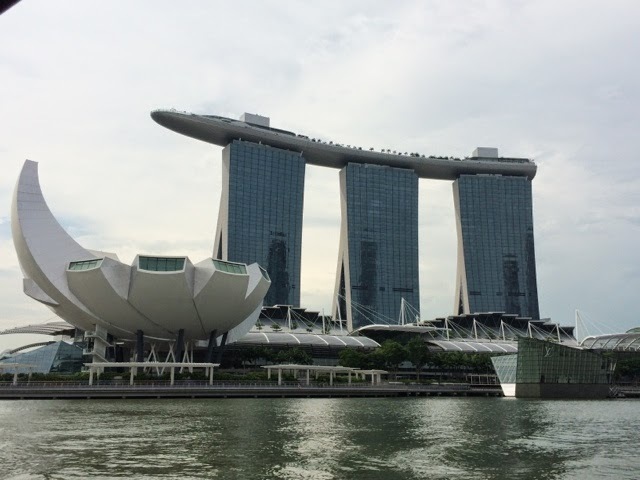 On the Duck Tour, with Marina Bay Sands in the background. Not quite a good selfie here. 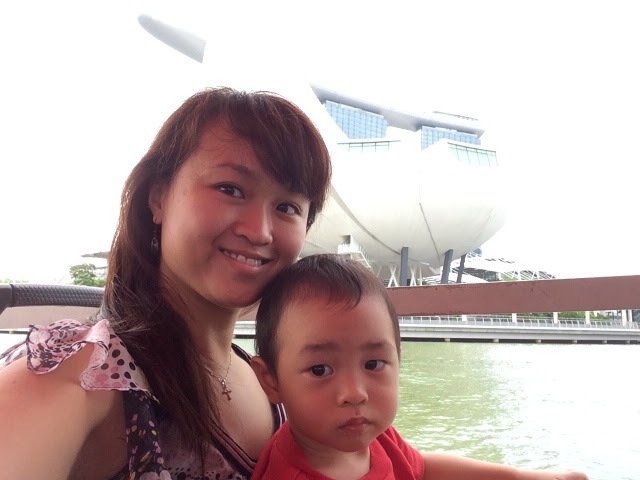 Art Science Museum - I must really make a trip there. 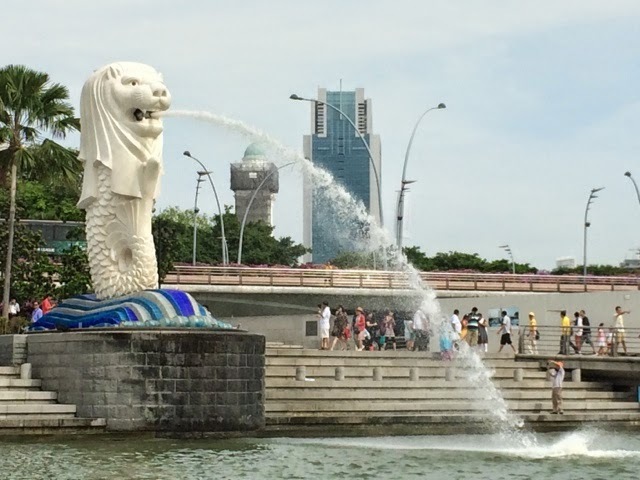 Isaac was able to tell me this was the Merlion. I must have mentioned it before. 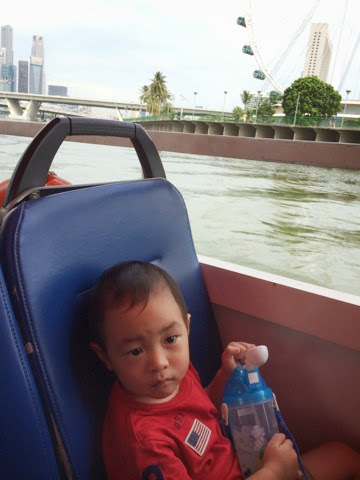 He kept talking about Merlion "spitting" water after that. Yet another icon. The Flyer. Sleepy at the end of the ride. I must say, the Duck Tour was quite good. It allows you to see quite a snapshot for a more detailed exploration. I would recommend it! I made pasta and decided that dinner for two in the park would be fun. 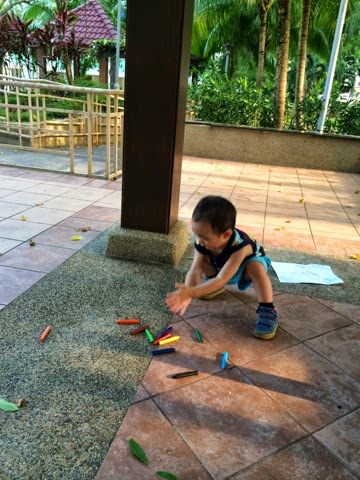 So, I packed everything and brought Isaac out for art and dinner in the park. 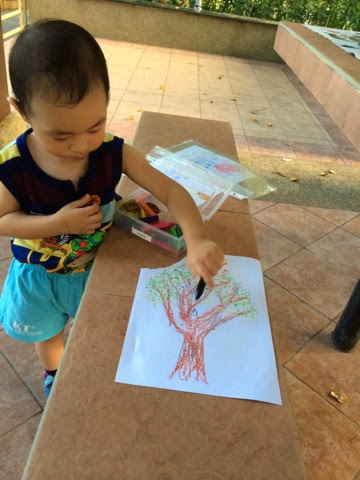 He started drawing everywhere after we did tree bark drawing. Cleaning up was a breeze. Just pick them up. 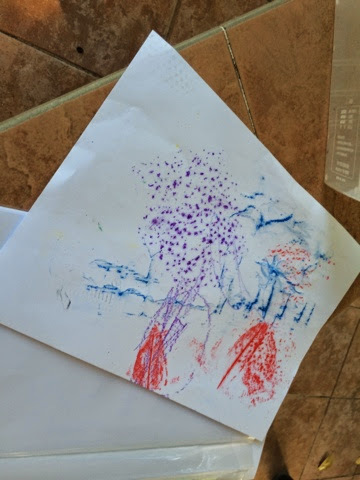 The art piece - combination of textured drawings. I'd say it's nice! I bought this apron long ago and saved up for painting day. 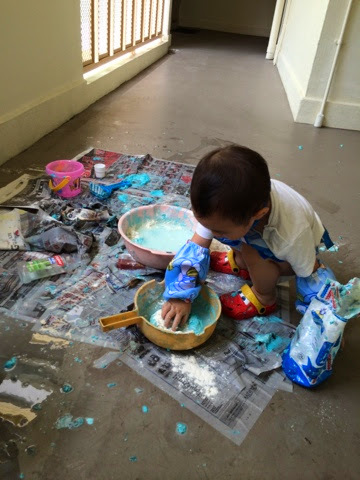 We got too busy to paint and finally, I used it for flour play. Trying to add food colouring - gotta remove cap? The mess it became. I put him in a bath tub after that so I could clean the mess. It wasn't that difficult considering the town council had someone doing block washing on that day! Coincidental and convenient. Of course, I did my part to clean up as much as I could. So, the story is even my hubby caught HFMD. That doesn't change the fact that we need to work on the house renovation. In view of the carpentry work tomorrow onwards, we made a trip to ikea to buy Isaac's shelf. We hope the contractors would kindly piece them together for us! 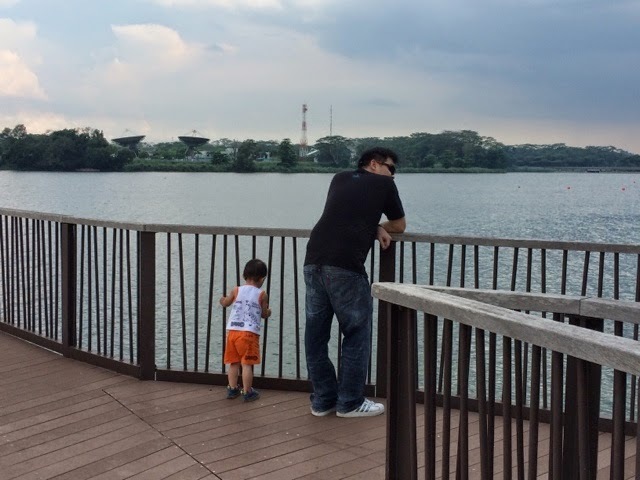 After leaving the unfixed shelf at the new abode, we decided to make a quick stop at Lower Seletar Reservoir. This is one of the many attractions we like at our new estate. It was a fine day (before the dark clouds gathered) to walk down the jetty. They call it the heritage bridge (if I remember correctly). Nevertheless, I had a pleasant finding. This place is perfect for Isaac to hangout and for us to chill! 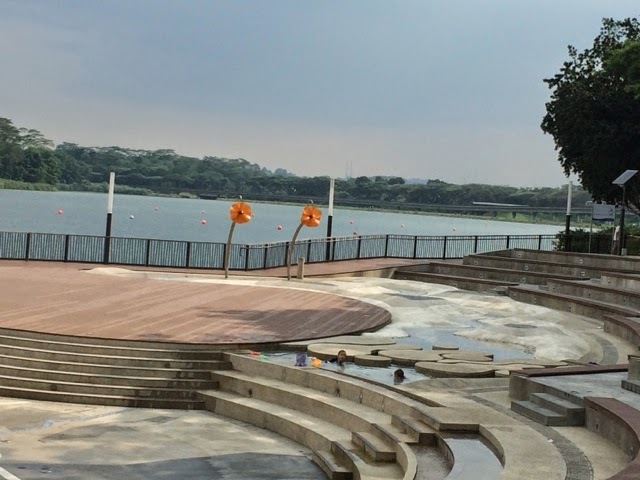 It has a small water play area, made of natural looking rocks/boulders. 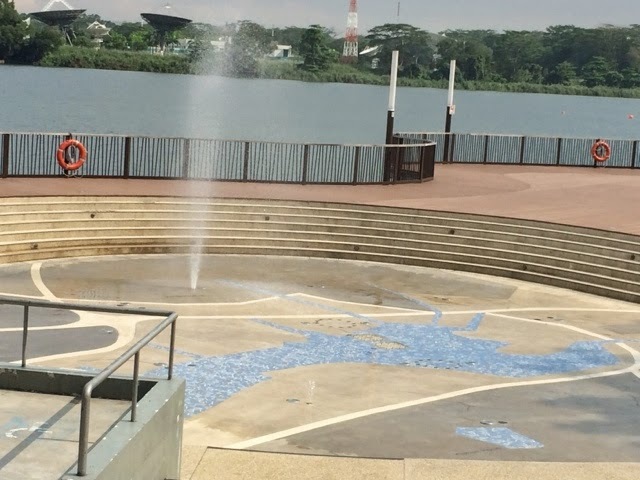 There are fountains spurting, board walks and big steps for parents to sit and observe their children without getting wet. Since it was quite confined, it is safe for adults to just sit and relax, listen to the water, breathe fresh air and look at the still water. We were not prepare for water play at all so we promised Isaac a return trip. Then we walked on to explore the bridge. 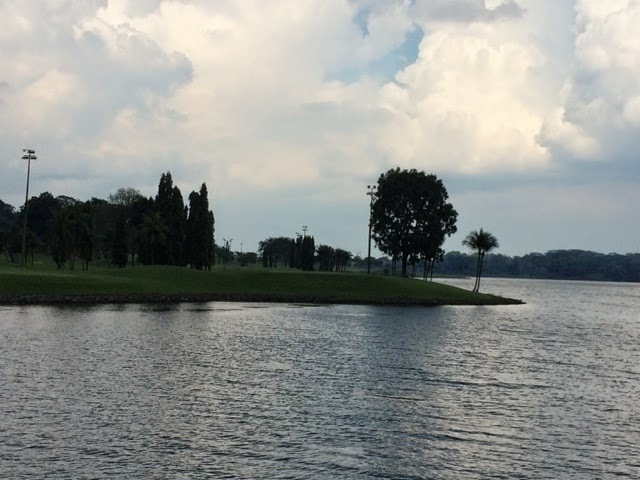 Along the way, we stopped and looked at the water and Orchid Country Club's green right across. I have to say, it's pretty scenic. We also spotted a water snake or turtle swimming, occasionally poking its head out. We couldn't make out what it was exactly. There were also tiny dragonflies with blue heads and slim bodies flying about the concrete and boardwalk floorings. Isaac had a good time chasing after them. At the end of the bridge, there was a platform that looked like a stage. We decided to lie down and looked up at the clouds. 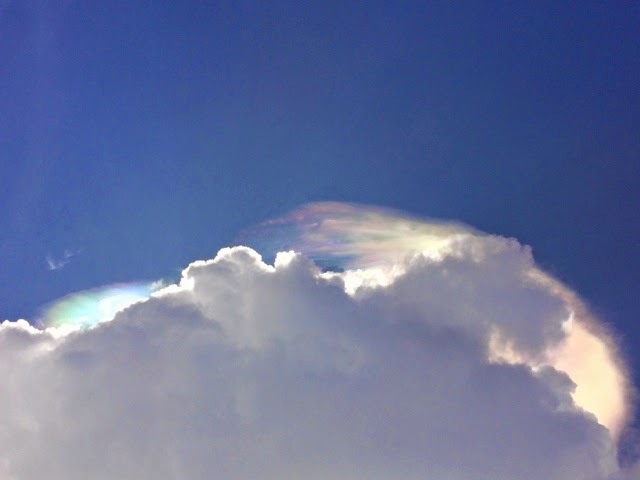 We saw a blend of rainbow colours peeking from behind the clouds and a balloon blown away by the wind. We laid there for a few moments, eyes closed and enjoying the quietness of nature. This is currently our favourite place in the new estate! Picnics and runs shall take place here. Water play with a really small pool. Boardwalk on the side. When we were leaving, we saw more water jets. It looked fun and very inviting in the hot weather. 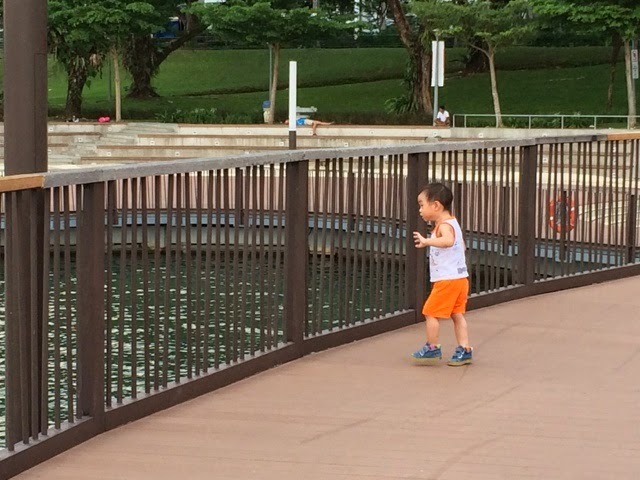 Isaac observing the reservoir waters and the greenery opposite. 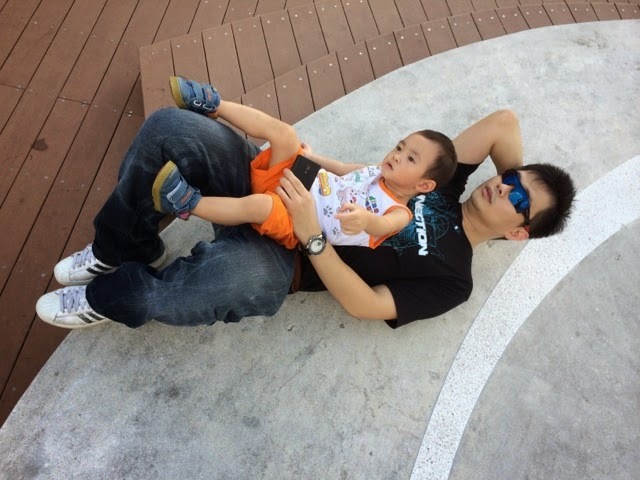 Daddy and son enjoying the moments of tranquility. 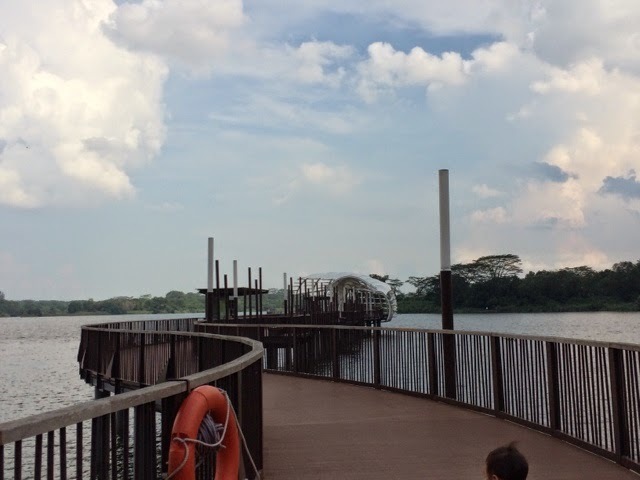 The heritage bridge, interspersed with history about the reservoir. Exploring with curiosity. 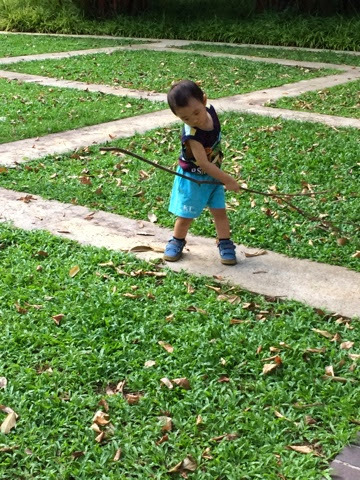 Chasing after dragonflies. Lying down on the platform to enjoy the views above. 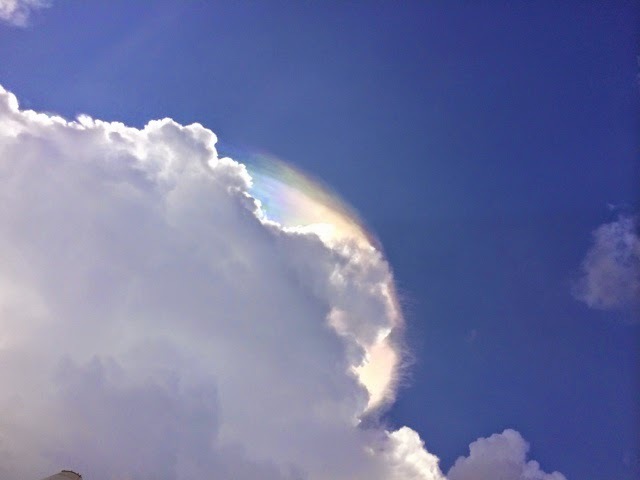 How often do we just rest and look at the clouds? I am glad we enjoy this all the time. The platform looked like a helicopter pad actually. Hubby had to attend a course today and Isaac was confirmed clear from HFMD! 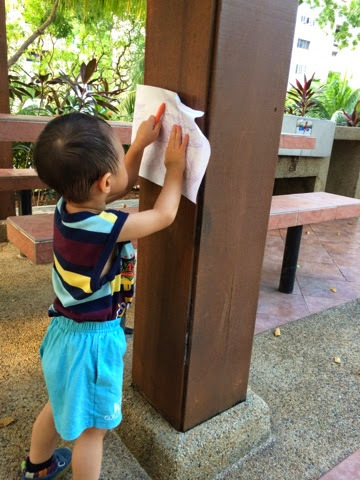 I promised him for days that when he was well, we would go to the playground. He had been so cooperative I decided to reward him with not just a playground but one with adventure. I have been eyeing this garden but haven't had the opportunity to go. There was no better day than today - good weather, mood and news! The only thing was getting there was not as clearly directed. Maybe it was just me. Just to share with you, there are three ways - bus, MRT or taxi/car. No brainer! Just teasing. We went there by taxi. Jacob Ballas Children's Garden is located outside the main botanic gardens. It is nearer to NUS. So, you will need to tell the driver to stop there. If you drive, there is a carpark just right outside. If you take the MRT, you will need a map. The signages are not very clear and if you have a bad sense of direction like me, get ready to bring stroller and snacks for getting lost. You will get there, eventually. Some reviews on the gardens. It was like a mini version of the botanic gardens with plants named and explained. We liked the sand playground, water playground, treehouse with sand pit, suspension bridge, sensory gardens where we touched and smelled herbs and other plants and those tiny pavilions for resting. 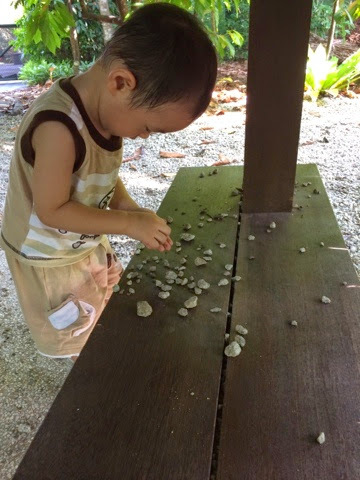 Isaac was able to spend a good amount of time just playing with stones at the pavilion while I watched on. I like that the garden has low trees and plants. They were all child-sized! I felt I entered a wonderland. The playgrounds were quite bare. Unlike the usual ones, they had minimal equipments. 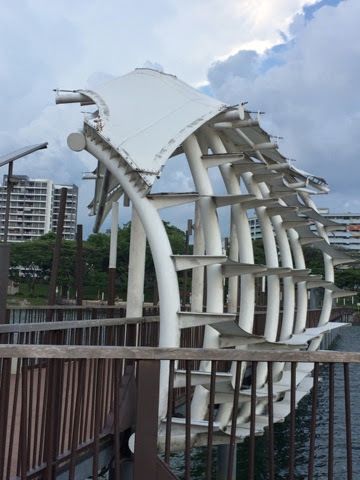 For instance, there were only two slides at the treehouse and one was under maintenance. Speaking of which, many areas were restricted or under maintenance too. Nevertheless, it was really fun because we walked through "jungle" (so said Isaac, who started singing "who's the king of the jungle" and "walking through the jungle"), saw ponds, played sand, stones and walked on logs. I wasn't prepared for sand play and didn't bring any toy. Highly recommended! - there is no shower area, so it would be good to wash off sand at the water playground (I had to wash Isaac at the sink). - the Kidz Cafe had only junk food and the place is too far from the main eateries. We could have eaten at those opposite the station at Serene Centre but I was too hot from carrying Isaac to the station. The ice cream at this cafe was very good though. I had lychee sherbet which contained lychee bits. Delicious! Other than that, he had a really good time. I wouldn't mind going back there. 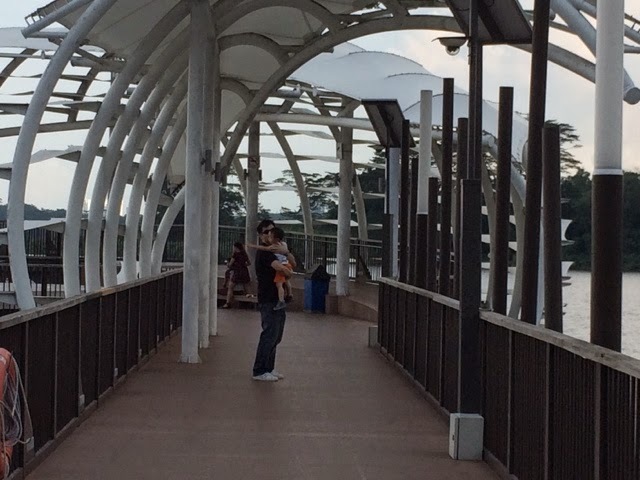 This time armed with sunblock, food to picnic, toys to enhance play and a stroller to and from the MRT station (not too far a walk, about 8 mins). 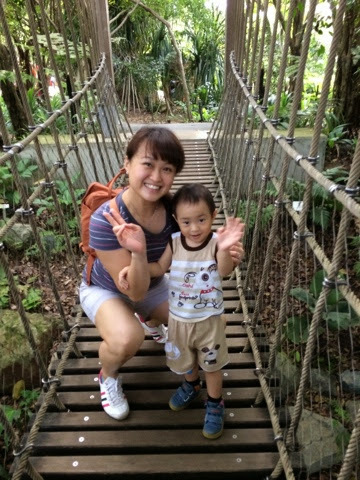 Us at the mini suspension bridge. It was quite an adventure for someone so tiny. 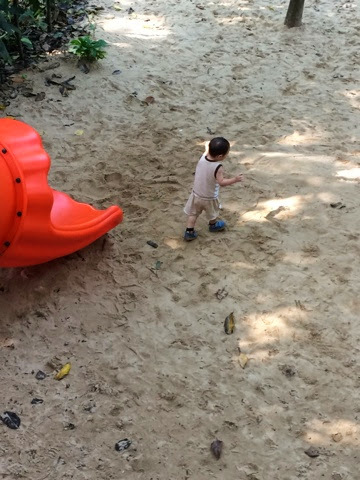 After sliding down the treehouse, he landed right onto the sand pit. This sand play area is better shaded than the actual sand playground. It is also more popular (read "crowded"). 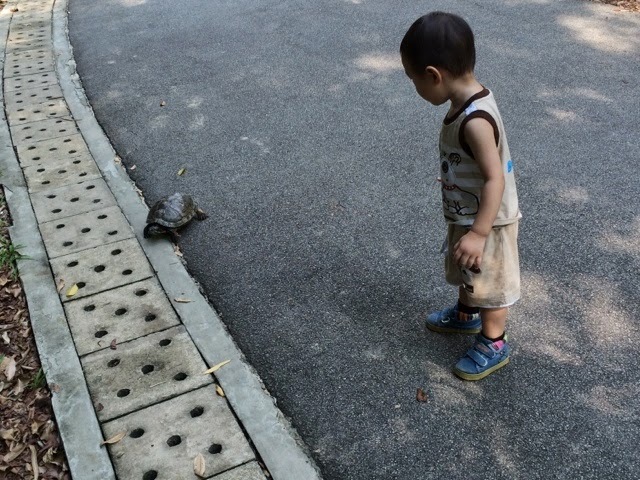 We spotted one big terrapin crawling. Isaac followed it all the way until it decided to go to the waterfall, which Isaac dislikes. He said "turtle was going to drink water". 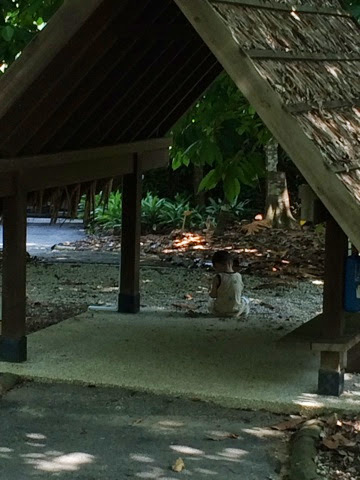 Isaac had a very good time just hanging out at this pavilion. I should have brought food. Fascinated with the stones. He spent a good amount of time just exploring them. 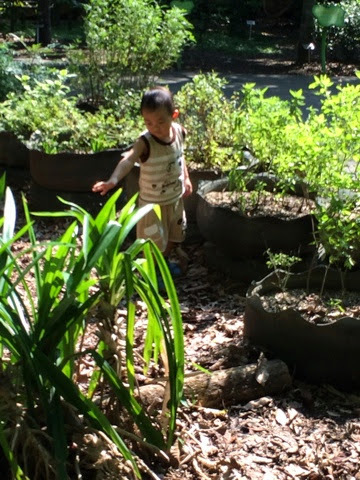 At the sensory garden, children can touch and smell plants. Some of them include herbs like basil and rosemary. It was getting really hot by then. I was more worried about him getting burnt. 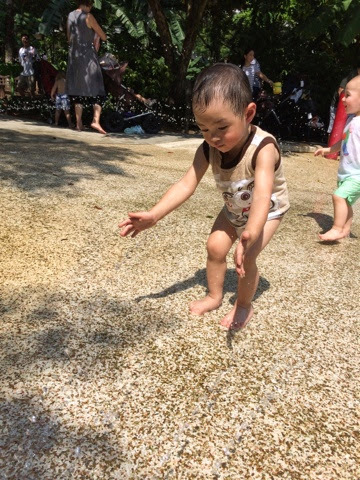 Playing sand with other children. 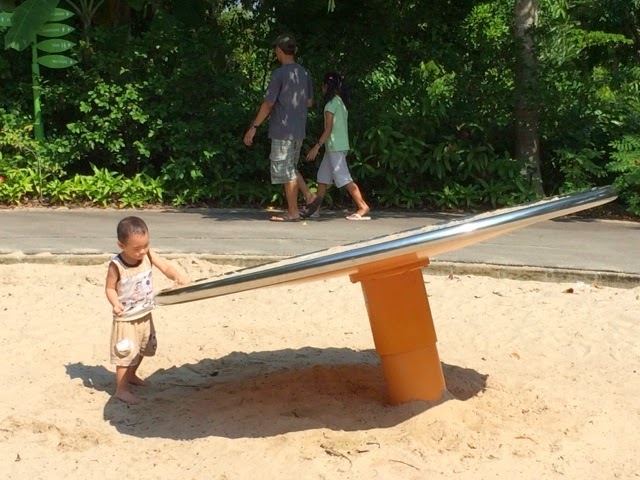 The playground has minimal equipments. 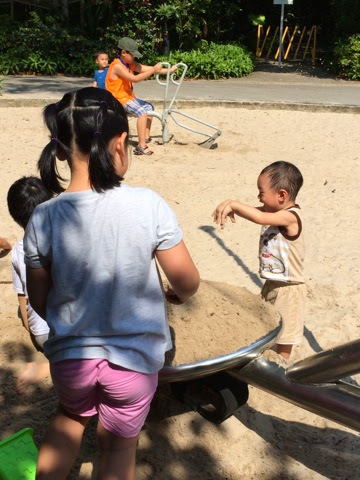 One of the equipments at the sand playground. Finally, I tried to encourage him to wash off the sand here. He was afraid of water jets. So, I ended up washing him at the sink at the toilet. The sink was tiny because it was child-sized. Good news to those who wish to go, entrance is free. Your child is your ticket to enter. Have fun with nature! 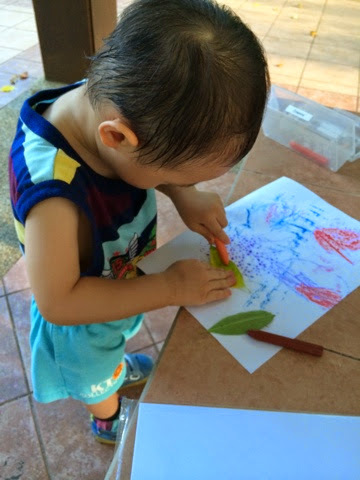 As I watched Isaac sleep, I am mso grateful he is attending my Childcare centre. This way, I can continue to be with him. Otherwise, after a long weekend, I will get love sick! Love going to the different houses to visit. Love watching him do things and surprised me with new actions or words. Love all the family time we get. 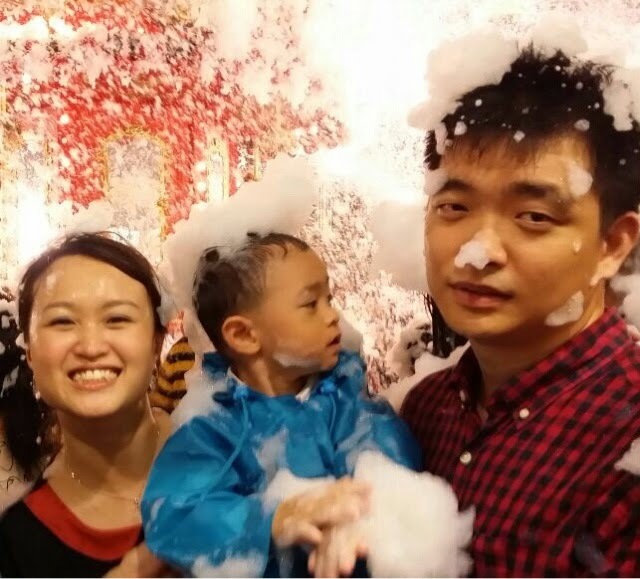 This CNY had been so fulfilling. We went to the zoo and I realized Isaac is really timid! He was afraid of the elephants after they splashed water at us. He was afraid of the dog, pony... He was even afraid of the water sprouts at the water park! Anyway, I am thankful for a really good husband. He deserves all our love for spending time with us despite his sinus affecting him again. 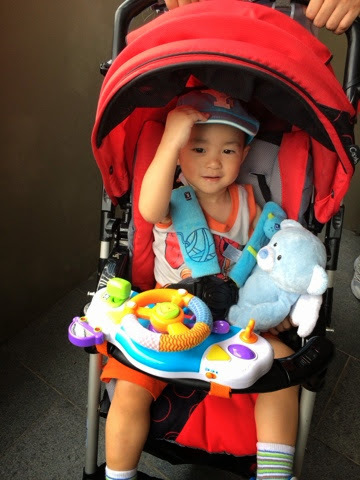 Here's a photo of Isaac all ready to meet the animals. I was busy in the kitchen and my Baby decided to talk to my son. 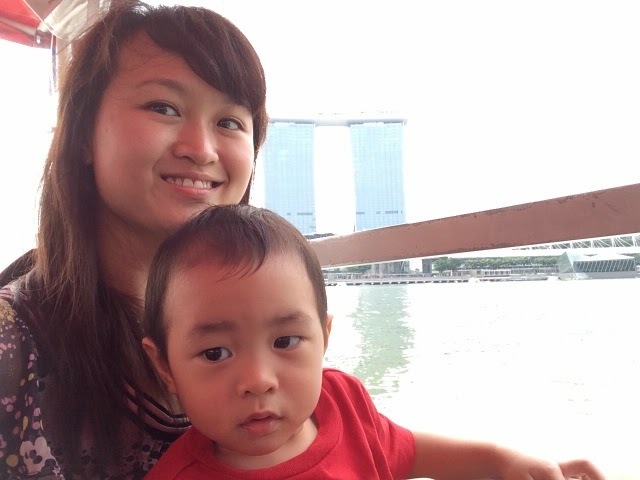 Baby: do you think I love you more or I love mummy more? Baby: yes. I love mummy more. Remember, I love mummy first before I love you. This conversation melted my heart. It is very rare for my baby to say such sweet words. So when he said these words, it's like honey to me! With valentine's day just around the corner, I really think this is a better gift than any material gift. Moreover, those words affirmed our love and relationship. I think it refueled the passion I have for my baby. Really want to remember this conversation. I love you a lot too baby. As I observe Isaac, I could really understand why toddlerhood is highly misunderstood. It is called the age of "terrible two", and that's all purely due to the lack of understanding about toddlers! They are so often deemed as being naughty, manipulative and full of mischiefs. If we take time to observe them and understand their actions or behaviors, we will realize that these behaviors happen for reasons. For instance, I saw Isaac throwing out clothes from a box I packed for donation. My first reaction was to stop him. While packing the items back busily, I asked him why he did so. Naturally, he couldn't explain, except "throw and pour". Wouldn't you agree that at this point, we would have thought he was being mischievous or just curious? When we were exiting the room, I remembered he was holding a toy spoon when he entered. So I asked him about it. He ran back to the box, peered in and told me "throw and pour". Then I understood what had happened. He dropped the spoon into the box and he wanted to retrieve it. He thought if he threw or poured out the content, he could get the spoon back. I apologized for misunderstanding him and then taught him how to communicate. I also commended him on his desire to problem solve and explain the box was too big and deep, perhaps help was needed. That same evening, I put him in the bath so I could do the dishes and watch him. He suddenly stood up when I was just starting, and poured away the water. He said "I don't want already.". So, I went in and asked if he really didn't want to bathe. If so, I'll give him a quick shower. 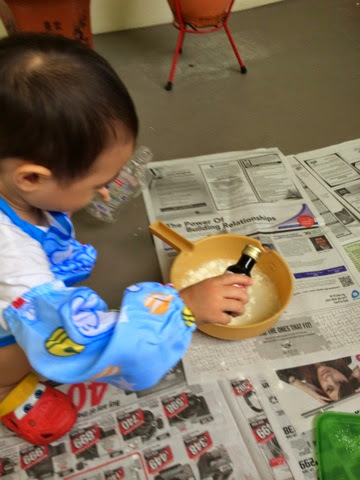 He asked me for a bottle he often plays with. I gave it to him and he told me he wanted to go back to the bath tub. How confusing huh? I laughed a little and explained that it takes a lot of water to fill a tub. Perhaps, we would do that again the next day. He understood and agreed to shower. At home, we talk about water conservation a lot and we practise turning off the tap while soaping. So, there wasn't a fight to put up with. Of course, it is not always so easy. Every time I talk to or manage a toddler, I have to prepare myself for a surprise. Another one often takes place at meal times, to which I regularly observe how care givers react. Isaac sometimes picks food out from his bowl or pours the content onto the table. Have you wonder why children would do that? How about the fact that they do not want certain ingredients, gravy or that they saw another option and wanted that? Or how about, they just dislike that dish? Instead of asking for help, they decide to problem solve by imitating what they see. 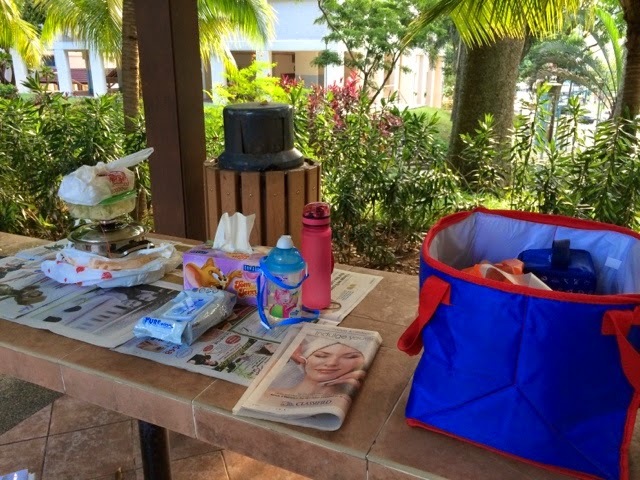 We spit out unwanted food (but they spit out directly on their clothes - so, wear a bib and tell them to spit out somewhere on the table), pick out food just like we do and pour unwanted contents into the bin (but they understand pouring unwanted contents). It's their food afterall. I call this problem solving skills with the inability to communicate properly. They are really not that refined yet. 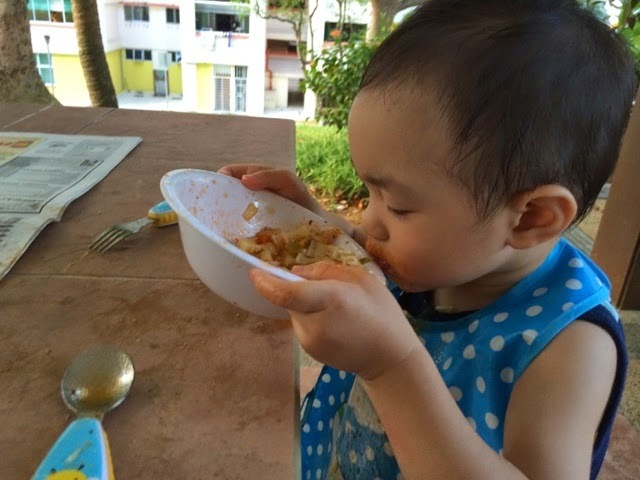 If adults also have food we pick on, what's more a child with heightened senses. They explore the world with all of their senses anyway. And it's literally so! How about another example? Bringing a child out and a child gets stuck at one position, refusing to move. So, we do what seems logical. Get down, scoop child and go away with a wailing child. How about, get down to his eye level, see what he sees and then be in the moment with him? You will be amazed at what you will learn about your surroundings and your child's intelligence and the development of his thinking. If you are in a rush, talk to the child, agree on a time such as 5 minutes. And even after that, you leave with a wailing child, you can explain and remind him about the agreement. Then, divert his attention. This helps to calm him down faster. 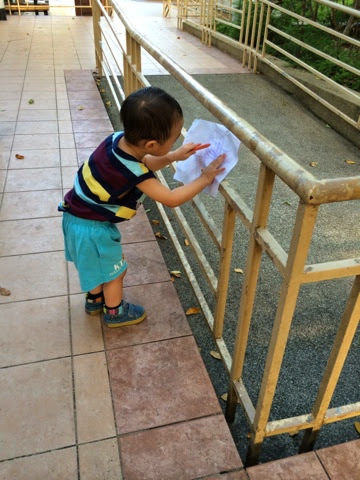 And, always give ample time when you bring a toddler out. Give yourself more than enough time to discover the surroundings. Of course, the list goes on. The point of this piece is to tell you, my readers, that toddlerhood is highly misunderstood. 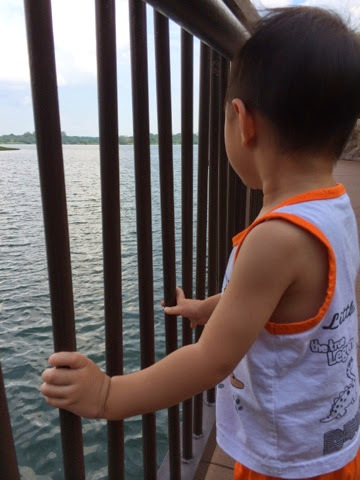 While they learn about the world and learn to speak, they are attracted by many things around them to explore. They are also learning to be more independent and solve problems. I always tell my friends, we were born very clever. But with too many "nos", "cannots" and conflicting signals, we become less innovative and confident than we should have been. What do I mean by this? If a child tries to problem solve but ends up in a mess, how would you react? I'll praise him for his desire to solve problems. And I'll show him alternatives. If a child cannot communicate and ends up in tears due to frustration, how would you react? 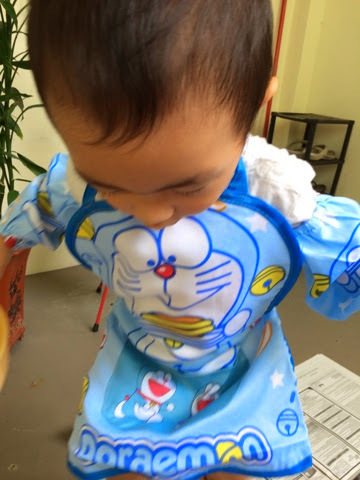 I'll try to understand his frustrations and teach him to talk - giving him vocabulary to express himself. I'll sing songs with him, read books about feelings so he understood them and learn to tell us. Be mindful it is a long process. Don't expect immediate results. If a child needs a space to just meltdown and let out his feelings, what would you do? I'll find a place that's safe for him to let out. And I'll tell him that I understand he is feeling upset, I cannot understand what causes it because he hasn't told me and the only way I could help him is to let him vent. This is simply respecting his feelings. Don't we have moments we just want to let out our feelings? There are times, I explain he can't have everything he wants. That's the real world. And we will learn to cope with disappointments. Lastly, don't assume what a toddler wants. It's good to provide options and ask the child. Listen and trust the child's decision. We want to have children who can make decisions, don't we? Toddlerhood is perhaps the most intelligent age. This is the age where children are getting connected to the world. We do have the ability to build or crush them. Sometimes, all it takes is, step back, observe, ask questions and respond. Truly, parents and teachers are human too. We just have to hold back a little sometimes. The essence of living, is to live it to the fullest without regret. I am living such a life in my truest self.